Well, wish you could record a Skype conversation for future reference. As one of best Skype video recorder on Windows, Dvdvideosoft’s free Skype video recorder allow you to record Skype Calls when talking to your friends across the country. The apps are pleasant with excellent features to make high quality call recording. It is a new experience to all windows users since you can now record various conversations whether for personal or commercial uses. You need to install call recorder software on you device for efficient calls with your overseas friends, family members or your fiancee. When you compare this Software with TalkHelper Software, which is one of the best Skype Recorders in the market, they are almost the same serving the same purpose! 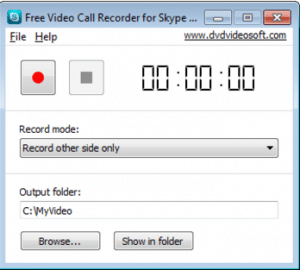 Dvdvideosoft is a free app and you should consider it to record Skype calls without limitations. The software comes with simple interface to favor all users and starters of windows. All you need is to choose your favorite call you need to record then select output folder to store the content. It is wonderful to get this application in the market, which works well giving the best to all users. Download the application from the software website free of charge. Dvdvideosoft Recorder is safe and free to download. You just have to run it! To launch the program, go to Start-All Programs-DVDVideoSoft-Programs-Free Video Call Recorder. Or you can just decide to click on the application icon to launch. Start the record call by clicking the Start button. Halt recording by using the Pause/Play buttons. You can now find the output files by clicking the “Show in Folder”. 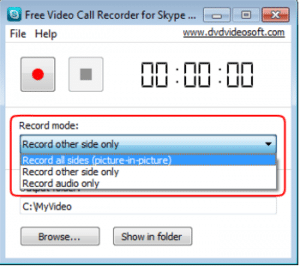 The Free Skype Video Recorder can only perform well if it is configured in the right way possible. You can now choose the best mode that will suit you best. The drop-down contains the following modes, record audio only, record all sides and record other side only. You will need a good customization output folder so that you don’t get confused with your files. The procedure is simple and straight forward. Navigate to “Browse” and select the right output folder. With this application, you can record audio and video on both sides of the conversation: The feature is important for later reference since you will get the exact content. Simple to use and simple interface: This application is straightforward to all users and starters. All you need is to follow the instructions and enjoy the call recording. Dvdvideosoft needs low processor requirements: This is helpful to your computer and it will not end up with hiccups and stutters. The app will run smoothly and still leave enough space for your RAM to run other applications. It is possible to pause while recording and even chop out some segments of your conversation, which may be not of important. The feature is excellent mostly for commercial users and you have every good reason to use this software. The program has the ability to create MP4 video calls and mp3 from all audio calls that are usually supported by modern players. It means you can replay your recording in other external device. The experience is awesome and you need to try this. The other pleasing thing about Dvdvideosoft Free Skype Recorder is that it does not contain spyware or any adware. This application is safe and free from virus when installing to your device. The application is free to all window users for both personal and commercial use. With the application, no extra libraries for the program to run. This software is only compatible with window devices only. It is disappointing to the other users since they cannot install the application! 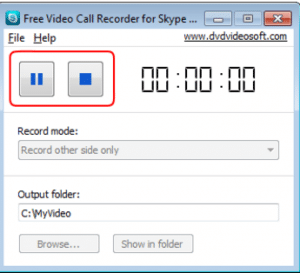 Skype claims that this application runs smoothly to all windows but you may have hard time with Dvdvideosoft Free Skype Recorder. The software performs well to windows 10 and windows XP. With other version, the results are not responsive and you may end up experiencing hiccups and stutters. The condition hinders other window users out of place yet the app is claimed to compatible. When recording Skype conversation you must specify the folder you want to save your calls. Failure to choose storage folder you may not be able to access your content, which might be very annoying for commercial users. 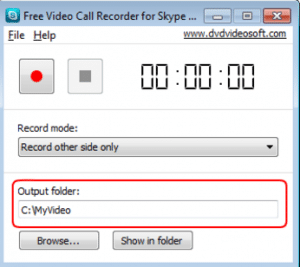 Dvdvideosoft Free Skype Recorder is manual, and you have to sect options for the application to function. 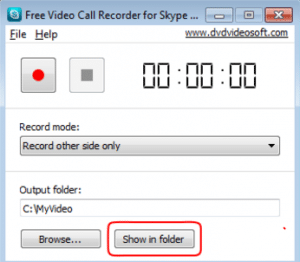 Like for example, when making a Skype call, you must click start button for the program to start recording. If you were recording an essential conversation and you happen to press the start button, then you will end up in a mess. You cannot access the unlimited services of this application. You will need to pay for the premium version. You can only record for less minutes. This means that you cannot work with this software for a long period of time or for commercial purposes. 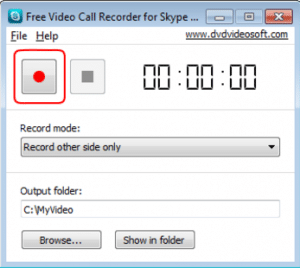 Dvdvideosoft Free Skype Recorder is nice software in the market to help all users in recording their Skype calls. The application has thrilling features although they do not offer the best as compared to TalkHelper Call Recorder. With TalkHelper Skype Software immediately after you start every conversation, the start button is activated to start recording. While Dvdvideosoft for Skype you have to click start button. Generally, I can say Dvdvideosoft Skype Recorder is a nice application in consideration the app is free yet you can record both audio and video calls. Nevertheless, it does not contain any spyware for the safe of you device. You need to have a try and record your Skype calls for free.